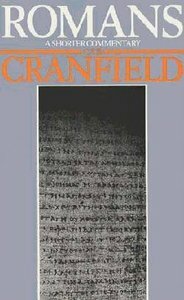 - Publisher Professor Charles Cranfield's magisterial commentary on Romans was published in The International Critical Commentary series. This is an abridged edition of the same commentary, omitting Greek text and reducing notes and references. About "Romans: A Shorter Commentary"
Professor Charles Cranfield's magisterial commentary on Romans was published in The International Critical Commentary series. This is an abridged edition of the same commentary, omitting Greek text and reducing notes and references.